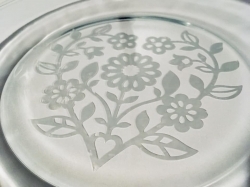 I love etched glass, and I have always wanted to create my own custom etched designs. With this simple class, you too can create your own! All materials will be provided. We will be making etched glass plates. Bring down your ScanNCut to make a beautiful etched glass plate. We will be suing designs built into the machine, If you want something custom, please bring the design. Call with questions! This class will be held 20 days.